Few things more powerfully affirm that we live in a messed up world than the headlines. Evil never misses the evening news. It’s always featured in one way or another. 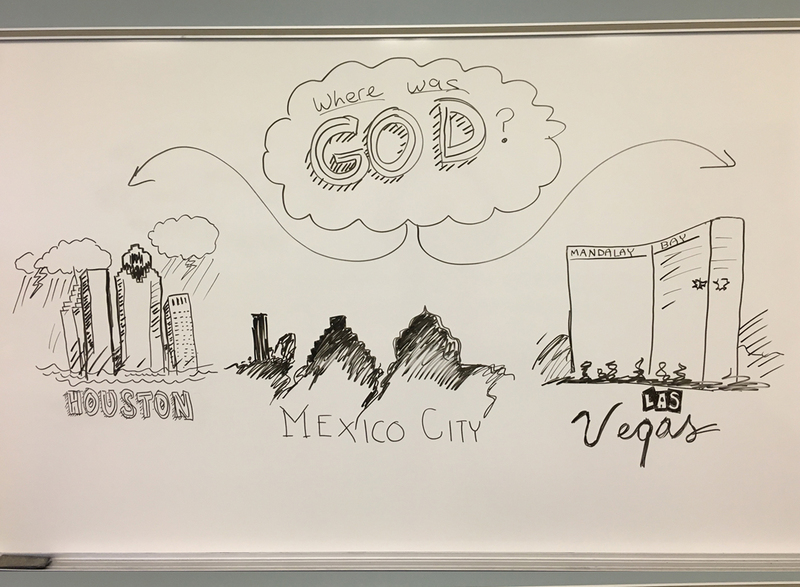 “Where was God?” is really a personal question. It’s different than “Can God exist when there is so much evil in the world?” The second is a question of the head. The first is a question of the heart. The emotional question of “where was God” is the more difficult of the two to satisfy. That’s because the biblical story provides a framework for understanding evil. Both moral evil (the kind that involves people doing horrible things) and natural evil (hurricanes, animal attacks, etc) easily fit into an explanation of the fall in Genesis three. We are fallen people living in a fallen world. But this doesn’t mean the believer cannot be deeply shaken when they personally encounter suffering. If you want proof of this simply read the Psalms. Living in a fallen world can be tough stuff. It’s not for the faint of heart. The Psalmist often expresses the feeling of being ignored by God, “How long oh Lord, will you forget me forever?” (Psalm 13:1). If you want an example from outside of the Bible of this tension between our theological and our personal response to evil, read C.S. Lewis. His first work of apologetics was a book called The Problem of Pain where he gave intellectual arguments for understanding human suffering. At the end of his life, after his wife died from cancer, Lewis wrote another book about the problem of pain called A Grief Observed. A Grief Observed is very different from The Problem of Pain. It’s a personal account of suffering. Instead of the calm voice of a confident apologist, it’s the shaky cry of a mourning husband. It’s a mixture of doubt and hope. Spoiler alert, in case you haven’t read the book, hope wins out in the end. Sometimes it takes a while for hope to float to the top. When believers ask the question “Where was God?” they often do so in an attempt, like C.S. Lewis, to align their hearts with the promises of God. This is surely not an easy nor quick process. The Bible offers us a helpful contrast as we contemplate this question: an all powerful God in the heavens or some reservoir of man-made confidence. Take your pick. Choose wisely.